Cops Say Video Showing them Steal Marijuana and Joke About Beating Disabled Woman, Is "Illegal"
Santa Ana, CA — In June, police raided a marijuana dispensary and were caught on a surveillance camera stealing the merchandise and playing darts. Police entered the “Sky High” dispensary in riot gear with guns drawn and were extremely disrespectful to the owners of the property. One of the occupants was handicapped and blind, and the officers were making jokes about her disability, and suggesting to one another that they should have assaulted her. “Did you punch that one-legged old Benita,” a male officer asks a female officer. “I was about to kick her in her f—ing nub,” the female officer replies after the police were in the building alone. After this video was released, it went super viral and exposed these abusive and corrupt officers for the criminals they are. Following the video’s release, the Santa Ana police department launched an internal investigation. Not that much was expected to result from the officers investigating themselves, however, in light of a recent and asinine lawsuit by the officers in the video, it’s possible that nothing will happen to them. There is nothing illegal about setting up surveillance cameras in your own place of business on your own property. 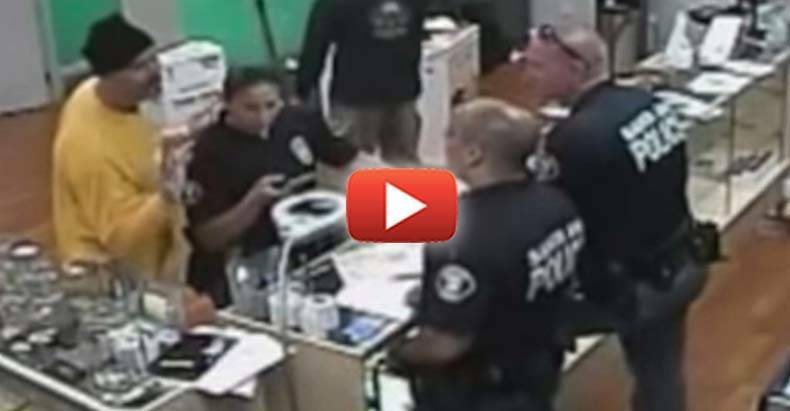 These officers are merely throwing a temper tantrum after being caught red-handed. “It’s pretty pathetic for police to say if we don’t like something that it can’t be used as evidence,” Matthew Pappas, a lawyer for Sky High, pointed out. In the video released by the dispensary, cops, in an effort to conceal their acts were seen dismantling all the cameras they could see prior stealing property and insulting disabled people. Their lawyer is now claiming that because the officers failed to destroy the other camera, it is inadmissible as the dispensary did not have consent to film them. Seriously. Ironically, the suit goes on to say how the video evidence is the only piece of evidence linking the corrupt cops to their crimes. Of course there wouldn’t be an internal investigation if the video didn’t exist as the video is what shows the cops committing crimes. Also, if there were no video, it would be the owner’s word against the cops’ word, and we all know how that one plays out. The audacity in this lawsuit is unfathomable, and it speaks to the sheer above the law mentality of police officers. They were caught, on film, breaking the law and now they are attempting to destroy the only piece of evidence which proves they broke the law. Imagine if the people on video stealing products were regular citizens and not cops. There would be no question as to the “legality” of the surveillance footage, and they would have been arrested. However, cops who raid shops that sell a beneficial plant to willing customers who use it as medicine to treat their illnesses, are brave heroes out there keeping you safe. Just because they joked about beating up a disabled woman and stole property does not mean they deserve to be punished or even lose their jobs. After all, there are plenty of other medicinal marijuana dispensaries to shut down, some of which may even be engaged in the horrible criminal activity of helping evil children treat their cancer or epilepsy. All praise to the champions of freedom who kidnap, cage, and kill people over this wicked plant. Even if these officers are successful at removing the video from their “investigation,” they cannot undo the fact that it was watched by millions. Share this article with your friends and family to show them the truth, before they hear some “official version” of it which makes no mention of this key piece of evidence.